Charles Darwin Online ~ Android Forever! Many people disparage evolution and Charles Darwin (author of On the Origin of Species) without having read a word from his pen. I think that may be because of what we might prefer to believe, rather than what is demonstrably true. In any case, it has become easier than ever to read his actual words. 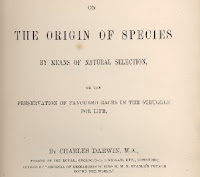 This web site features Darwin's complete works, in a very cool format. On the left you will see the text in a very readable font, while on the right will appear a scan of the actual hard copy page. If you would like to become more educated on his world-changing discoveries, click here.